How is the million dollar mindset bad? What are you looking at? 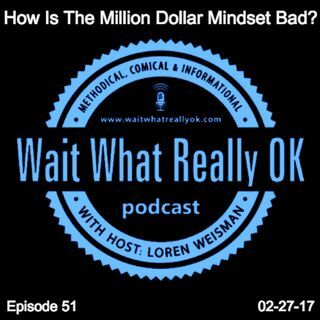 Wait What Really OK Podcast Episode 51 hosted by Brand Precision Marketing Strategist and Counselor, Loren Weisman asks why some admires certain millionaires and is it for the right reason and the right inspiration. Some just seem to think that some one that is a millionaire is somehow magical and that is the goal. But when you look deeper, is the mindset of how that person made their money or received their money really how ... Más informaciones you want to operate? Are you in the mindset that suits your needs, your morals, your drive and your dreams? Or are you taking on a mindset that is something that has nothing to do with you? Choose the mindset and the directions that will work for you and work the right way…as well as the legal way! How is the million dollar mindset bad? What are you looking at? Ep 51 of the Wait What Really OK Podcast is available on iHeartRadio. Podcast Blog Supplement for Episode 51 of the Wait What Really OK Podcast with Loren Weisman. Podcast Link Supplement for Episode 51 of the Wait What Really OK Podcast with Loren Weisman. How does not taking the credit help you build up more credentials? Podcast Video Supplement for Episode 51 of the Wait What Really OK Podcast with Loren Weisman. Podcast Photo Supplement for Episode 51 of the Wait What Really OK Podcast with Loren Weisman.